Sorry, but C-Line 4 x 3" Staff Printer Badge Inserts - 240/BX is no longer available to buy. Name badges are the perfect way to say, "Hello!" As the creator of the "Hello, my name is" badge, and a market leader in name badge holders, we're ready to meet your every need with clip, colored stripe, clip/pin combo, pin, magnetic, hanging, security and pressure sensitive name badges and holders. This fabulous name badge inserts is perfect for customization for special events like office, tradeshows, meetings and more. 4 x 3" size fits perfectly with all C-Line 4 x 3" badge holders. It includes easy to use software instructions with the ability to be used with both laser and inkjet printer. 40 sheets with STAFF inserts are enough to make up to 240 name badges! Transcript: Welcome to MyBinding.com. These are the 4 x 3" Staff Printer Badge Inserts from C-Line. Welcome to MyBinding.com. These are the 4 x 3" Staff Printer Badge Inserts from C-Line. 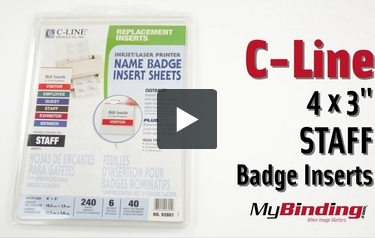 Keep all your staff easily identifiable with C-Line’s Staff Badge Inserts. These inserts present the wearers name in a clean, bold format, accented by the large “staff” label below. They can be written on with a bold permanent marker, or printed out with C-Line’s printing templates. Then fold along the perforations and separate the badges. Use with C-Line’s 4x3” badge holders and make your staff easy for everyone to identify. Also take a look at their visitor, employee, guest and member badges.